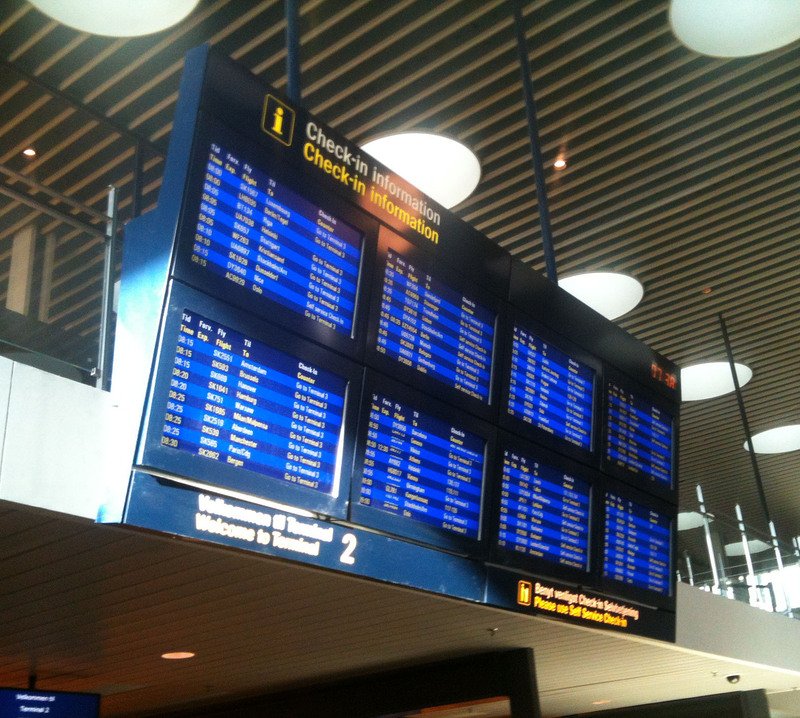 An airport is an interesting place to be, though it is a time stealer. To me to travel is not just about the final destination, but very much the sensations of the journey itself; the hustle and bustle of airports, ports and stations, to watch people of many nationalities with very different looks and attitudes pass by, and to listen to the sounds and to feel the movements of cars, busses, trains, planes, ships, while watching the ever-changing sky, landscapes and seascapes. Excitement is building … check-in information at Copenhagen Airport, May, 2013 (iPhone snapsnot for true ‘being-on-the move-not-paying-too-much-attention-to-quality-look’). Back at the airport: If you often spend time there, waiting or moving from terminal to terminal, why not optimize your journey and your health? These strategies work ‘at home’, too. Stay on your feet, e.g. stand, as much as possible. Do not sit too much, as it is true: It is a killer. And apart from being very bad news health-wise, the buttocks will take the shape of chair seats! Walk, don’t stand, on the airport conveyor belts and escalators. You will improve metabolic fitness and maintain weight even with small positive changes, e.g. walking instead of standing. Take the stairs instead of the elevator (when you have dropped off heavy suitcases); take the stairs as often as possible. It is great for fitness. Extended stair stepping improves muscle strength-endurance and cardiovascular fitness. Happy feet … (and legs and core and heart). Hi! Thank you for your positive comments, fellow journey fan! Great tips! I am always tempted to travel in my exercise gear, get out my yoga mat at the gate and settle in for a stretch, seems like such a perfect oppurtunity! Don’t think I am up to the stares yet though, so as you suggested I will stick to the stairs. Hi! Thank you for commenting. Never mind the stares; bring your yoga mat and stretch, 1) set an example, and 2) have the last laugh/stare for being the fittest. Next PostNext To cruise or not to cruise? That is the question.